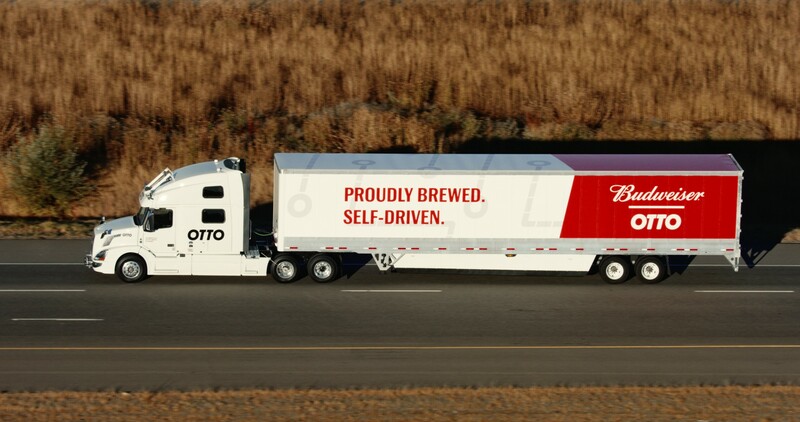 Otto, the self-driving truck start-up purchased by Uber earlier this year, recently completed its maiden voyage without a human behind the wheel. The precious cargo selected for the landmark journey? More than 50,000 cans of Budweiser, of course. In partnership with Anheuser-Busch and the state of Colorado, Otto hauled 51,744 cans of beer from Fort Collins through downtown Denver and into Colorado Springs using a semi-trailer truck retrofitted with an array of cameras, lidar and radar equipment. Otto said in a blog post that a human driver was in the vehicle but monitored things from the sleeper cab as the truck drove 120 miles down I-25 all by itself. The shipped cans feature a custom design observing the fact that they were delivered autonomously. Commercial trucking is just one of many industries that self-driving technology is poised to upend in the coming years. As it stands today, commercial drivers have a strict limit on the number of hours they can drive in a given period of time both for their safety and the safety of others on the road. A few years back, if you recall, a Walmart truck driver that hadn’t slept for 28 hours crashed into a vehicle carrying actor Tracy Morgan and several others. The crashed killed one and severely injured several others including Morgan who was in a coma for two weeks and spent more than a year recovering from broken bones and a brain injury. Autonomous trucks presumably wouldn’t be governed by such restrictions and could lead to lower insurance premiums and improved fuel economy, among other benefits. Conversely, a fleet of self-driving vehicles will inevitably put many of today’s truck drivers out of a job.